Playbooks and contract policies are an increasingly important best practice for legal teams of all sizes. 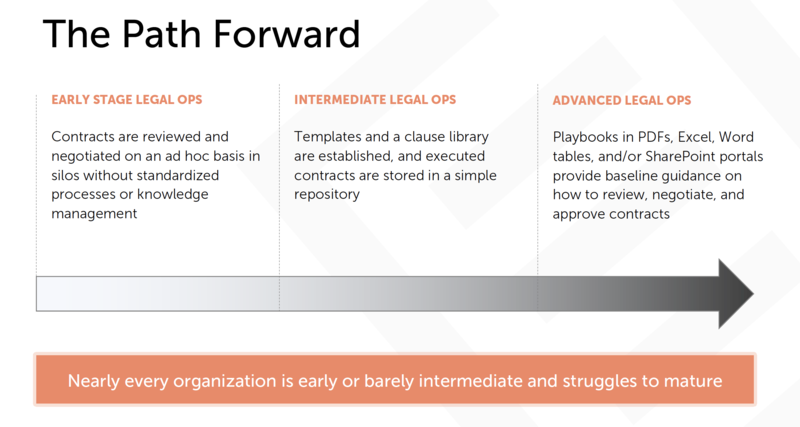 Over the past six months, we sat down with over ~300 legal departments and operations teams and surveyed how companies use, create, and manage contract playbooks in order to improve contract negotiation outcomes. We hope this series will help you identify where your organization is, and more importantly, what actions you can take today to move things forward. In Part I of this series, we'll explore maturity levels, where they tend to fall, and where we see the future heading. New hires have a difficult time "getting up to speed"
Change management: how do we get our team onboard the playbook process and how do we get them to use the playbook consistently? Writer's block: how do we get started? Metrics: how do I know that this will actually help us? Implementation support: where do I find time to define our policy and playbook? The last bullet in particular is true across small to medium size legal departments. Without a doubt, the number one blocker to moving maturity is the time it takes to develop and build a contract review process and strategy. Without strategy, we find a reluctance to improve. We also found that legal teams are growing reluctant to use the tools of today - e.g., Excel, Word, etc. and are trending toward point solutions that execute quick wins. Stay tuned as we explore further.